Tula's 223 Remington ammunition is perfect for your sporting and varmint hunting needs. 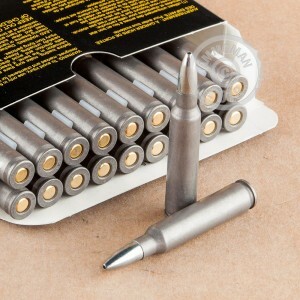 Each cartridge carries a hollow point, bi-metal jacket projectile with a lead core and features a polymer-coated steel case, resulting in powerful ballistics. These rugged but reliable cartridges keep their qualities under all-weather conditions and temperatures from -4 to 122 degrees. Over the last few years, Tula Cartridge Works produced and launched a variety of products for hunting, self-defense, and hunting ammunition under the trademark name, TULAMMO. Founded in 1880, Tula is one of the most reputable manufacturers in the world, establishing their brand as reliable, rugged, and economical. 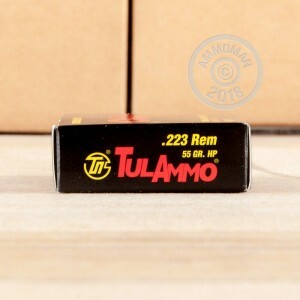 Get your 223 Rem ammo today! Every 6th or 7th round refused to fire. Pin dead center hit with no fire! Will NEVER buy this crap ammo ever again!!! This is great plinking,training ammo, and im hitting WITHIN 2 moa,with my stock mp sport 2 barrel at 100 yards,actually between 1-2 moa. Excellent ammo. Works great in quality ARs. I love that tula changed to all zinc coat bullets. Seems quite a bit more accurate than fmj do to even coating. No misfires, hangs set and barrel appears cooler after many rounds. Very little cleanup later. I have not had a chance to fire any of this ammo. Have not fired a round yet. I bought a bunch of this for prairie dog hunting and took it to my range to zero at 200 yds. It grouped inside moa at 200, 300, and 500 yds with no misfires, fail to feed or any other problems. My AR (Bushmaster) was a little dirtier than normal after a day at the range but cleaned easily. I almost don't want to give it a great review because then demand will increase and the price will go up. I'll order some more before the next Prairie dog hunt.